At 2:00 p.m. today, the U.S. Federal Reserve will release its infamous "dot plot" showing projected interest rates, along with economic forecasts and a policy statement. Now, it should be noted that the Fed has a terrible forecasting record. Nonetheless, markets will continue to hang on every utterance of the gnomes in the Eccles Building. Fed Chair Janet Yellen said prior to May's disappointing jobs report that a rate hike would make sense "in the coming months." After the May report, she started to backtrack. 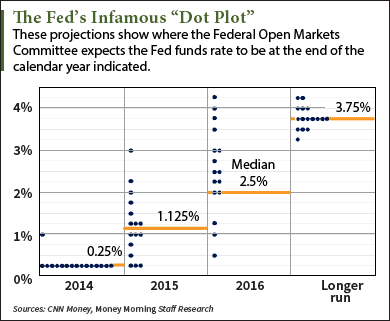 The Fed originally projected four rate hikes in 2016, but now we are more likely to see only one. And we certainly aren't going to learn much of anything today – unless you think the opinions of people who are consistently wrong are worth knowing. Eight years after the financial crisis, virtually all of the central banks are still engaging in crisis-era policies with little prospect of reviving economic growth. The Fed is talking seriously about raising rates, something it should have done more than two years ago. But it is choosing an incredibly awkward time to get religion. And it is moving at the pace of a tortoise crossing the road to actually do something. The truth is, no matter what Yellen decides, we're still up a creek without a paddle. She can tinker with interest rates all she likes, but she's waited too long. She can't fix the mess we're in. Leaving the fate of the world in the hands of a bunch of former tenured economics professors proved to be nothing short of disastrous. While the Fed and mainstream financial media keep telling us that the U.S. economy is healthy, the facts tell a different story. In the United States, trade and demand are weak while manufacturing is hovering just above recession levels. Globally the story is much worse – trade is collapsing, manufacturing is in recession, and demand for goods and services is falling. In fact, global trade is at its second-lowest level since 1958 and is falling in both dollar and local currency terms. As Gluskin Sheff's David Rosenberg points out, the labor market is anemic despite headline numbers suggesting otherwise. Rosenberg believes that the lack of strong wage growth is a sign that we are far from full employment: "There are officially 8 million unemployed, but in reality, when all the underemployment is accounted for, that number is far closer to 20 million. The definition of the labor force renders the unemployment rate a meaningless statistic. There are a ton of folks not in the traditional labor force who would readily take a job if offered one." The employment-to-population ratio is a disappointing 77.7% for those aged 25-54 years old compared to 80% in early 2008 and 78.8% in September 2008 at the time Lehman Brothers collapsed. That's significant. This means the Fed may be about to embark on a tightening cycle with the employment-to-population ratio at its lowest level in decades. It has never made such a move before with this ratio below 80%. This critical fact appears to have escaped the attention of the who-knows-how-many-but-surely- too-many economics Ph.D.s laboring away at the Fed in Washington, D.C., and around the country. I have argued for years that America suffers from a structural and not a cyclical employment problem; underemployment is not merely a result of a sluggish economy (i.e. insufficient demand) but also due to a mismatch between available jobs and the skills needed to fill them (due in part to our inane immigration policies). The Fed is fumbling the employment half of its dual mandate. It clings to models that tell it that the economy is approaching full employment while it actually suffers from high structural unemployment. Then again – and I ask this speaking as a former Ph.D. candidate at Yale – what good is a doctorate if it doesn't produce a useful idiot? There are other factors that render this an awkward time for the Fed to wake up and start raising rates. Delinquency rates on auto loans and student loans are increasing. Low commodity prices are causing higher delinquency rates on agricultural loans. Over 70 oil and gas companies have already filed for bankruptcy and there are more to come. And delinquencies on business loans are rising as well. And of course the default rate in the high-yield bond market is rising sharply (and not just in energy). This is what happens at the end of a credit cycle. The Fed is choosing a terrible time to wake up from its torpor and gather the courage to impose the necessary discipline of normalized interest rates on a spoiled economy. My bet is that it won't get very far before it feels compelled to back off, as stocks and other risk assets sell off sharply as the cost of capital starts rising. In addition to the high-yield bond market, we are also seeing this occur in other inflated pockets, such as the grossly inflated Miami condo market, where every lunatic builder from around the world figured he could plant a disgustingly ugly piece of Damien Hurst "art" in the lobby of a building and con people with (for now) too much money into overpaying for apartments whose first two floors are going to be underwater in a couple of decades. Believe me, America's voters aren't the only ones suffering from a form of mass delusion. Janet Yellen has a lot to answer for, but she's hardly the only one. In fact, six people – powerful individuals – have systematically destroyed what was once one of the world's safest investments: bonds. Michael has decided to name names and call these bad actors out before it gets any worse. Click here for his Bonds Exposé, and you'll get his bombshell report, which includes his recommended bond alternatives and free access to his Sure Money service. During the crisis I wrote a letter to Bush and explained some what the same thing you are saying how. In a slow moving world GDP rates at 2 percent growth are going to be hard to come by. This interest rates at 2 percent are going to be way too much for a slowing world. They have no policies for deflation which is one reason we are not growing. They have to have policies that are going to increase a slow deflationary position. Not to say that I have all the answers but giving people raises every year isn't going to help if people stop buying. Inflation is: Too many consumers chasing a limited number of goods or services. Deflation is the following: Too many goods chasing a diminishing number of consumers in need of goods and services. The worlds largest consumer is basically broke and on life support. The current Empress at the fed is naked and in search of a woolen jacket while the rest of the world is wearing a bathing suit at this time. She should have put the clothing on earlier. Those that cant do what ? Answer: Teach; those that cant teach well they get ten-year; the worst ten year professors of economics go one to teach the rest of us at the Fed. To bad many have never had a job in the real world, when the rest of the world learns this it might just get very interesting ?? The real reason for the recession is the rapid growth of the federal government which produces massive economic inefficiencies such as diverting capital from productive use to political cronies that waste resources, and to the expansion of government agencies. The government agencies create red tape for businesses and the government employees consume goods and services but don't produce anything of value to export so that imports swamp exports. They way to stimulate the economy is to drastically cut federal spending along with the red tape, close federal departments and lower business taxes. Such a policy might cause short term pain followed by a roaring economy. Instead the nitwits in Washington try to stimulate the economy by hiking federal spending which only adds more economic inefficiencies. As federal spending grows the paychecks of average Americans shrink in purchasing power. Although the Fed's decision on interest rates tomorrow is key, what really could move the markets is what Fed chief Janet Yellen says in her post-meeting press conference.